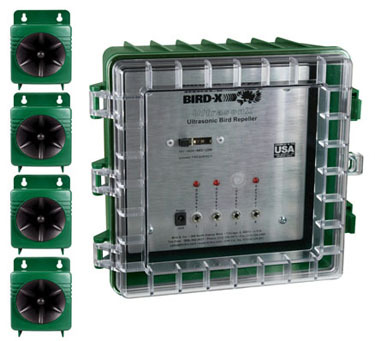 The Ultrason X® is a high-performance bird repellent system. It is the world’s first ultrasonic repeller specifically designed for outdoor, year-round use. The Ultrason X® is ultrasonic so it is silent to humans. This makes it an incredible buy for those who want to ward off birds and pests in an outdoor eatery, retail, or patio environment. Typically, ultrasound equipment is only suitable indoors. The Ultrason X will work in medium sized outdoor areas (3,600 sq.ft.). Effectivly deters pigeons, crows, blackbirds, sparrows, seagulls, swallos, starlings, bats, and small rodents and varmit. Box dimensions: 19" x 13" x 8" / Shipping weight: 10 lbs. 110v cord is 50 ft / 220v and 240v cords are 6 ft.